Most of us wince apprehensively when we’ve dropped our smartphone, cautiously edging towards the ground, praying to the Gods that it remains in full working order. That said, there’s certainly a perverse pleasure in watching three gleaming, brand-new specimens of the most powerful, popular devices being dropped from various different heights. Well, there is for me, anyway. YouTube is littered with various videos showing how our treasured devices cope (or, specifically, fail to cope) under the immense pressures thrown at them. From gunshot rifles to molten lava, they’ve been well and truly put their paces, but the original, more everyday test we’ve seen time and again is the drop test. In order to try and decipher whether a device is robust as its vendors claim, devices are regularly dropped from different heights, and the entire event is recorded for the viewing pleasure of the masses. Today, a video as such, pitting arguably the the three most popular devices against each other, has been brought to our attention. The three smartphones used in this particular drop test are the iPhone 4S from Apple, the HTC One X, and Samsung’s still relatively new Galaxy S III. First up was the iPhone 4S, and despite the demonstrator seeming to extend the dropping session in order to try and break it, there was scarcely a mark on it. I know the iPhone 4S is not indestructible, since mine has a nice hairline crack which likes to slice my finger when playing certain games, but as the first one put to the test, it certainly did an impressive job. Next was the Samsung Galaxy S III, which didn’t quite match the Cupertino’s flagship smartphone. In fact, it didn’t even come close, and after being dropped from waist and shoulder height on both front and back, it was almost completely totaled. The screen wasn’t responding, and the device was essentially rendered useless. 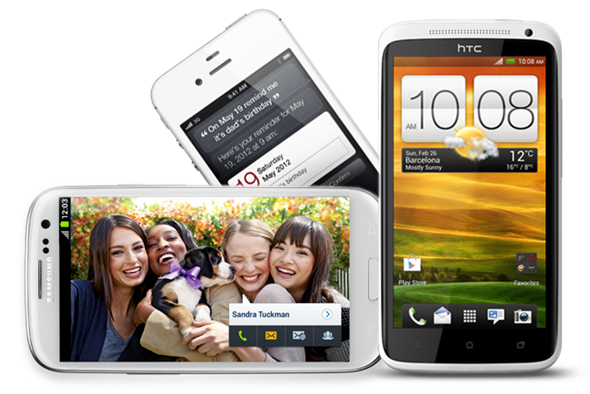 The HTC One X completed the proceedings, and the rivaling Android powerhouse had a much better experience than its fellow quad-core counterpart. Much like the iPhone 4S, it emerged largely unscathed, and although Samsung’s offering will always be more popular among consumers, those stuck between which powerful Droid to purchase should check this video out with interest.